Taking artistic license with a dramatic version of a musician's life is par for the course in film. In Freddie Mercury biopic Bohemian Rhapsody, certain things are left out and dates of important events are merged to deliver a whopping, crowd-pleasing crescendo at Live Aid in 1985; so favouring the momentous performances of Queen over any actual insight into Mercury's life. Initially helmed by Bryan Singer with Dexter Fletcher then taking over directorial duties this is a loud but disappointingly tame account that follows a generic by the numbers screenplay by Anthony McCarten informed by Brian May and Roger Taylor's input. We all know Mercury as an outrageous and hugely talented performer and a flashily-dressed Rami Malek does a great job storming the stage with a passionate and physically impressive performance. The recreations of the live gigs are entertaining but it's a different story behind the scenes. 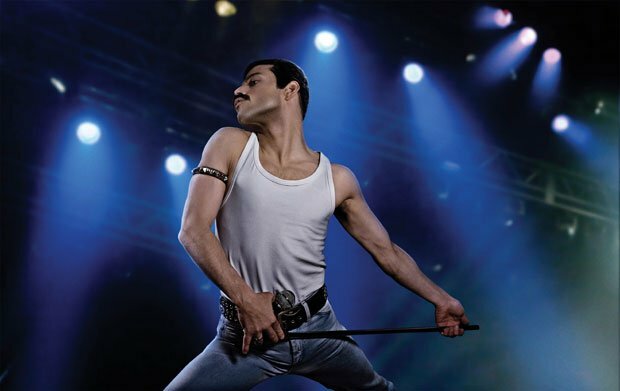 A lot of the film is spent in recording studios as a way to reveal how Mercury and the band came up with bangers such as 'Bohemian Rhapsody', 'We Will Rock You' or 'I Want to Break Free'. For some reason, however, the inventiveness of the songs is lost in shouting matches, Freddie turning up late, the band literally explaining the intent behind the tracks or embarrassing nods to Wayne's World. The film seems fixated on being a portrait of the time rather than a portrait of a man who was born Farrokh Bulsara to an Indian family, moved to London in the 1960s and became a musical legend. There's mention of his heritage, and bland conversations between family members, but none of it hits any emotionally engaging notes. And forget any nuance or tenderness when it comes to Mercury's sexuality or identity, as it's all depicted with appalling and cringing broad strokes. General release from Weds 24 Oct. The Freddie Mercury story. Malek as Mercury does a great job, with a passionate and impressive performance, but despite the recreation of momentous performances it’s a disappointingly tame affair, with a by-the-numbers screenplay and a bland lack of insight into Mercury’s heritage or sexuality.